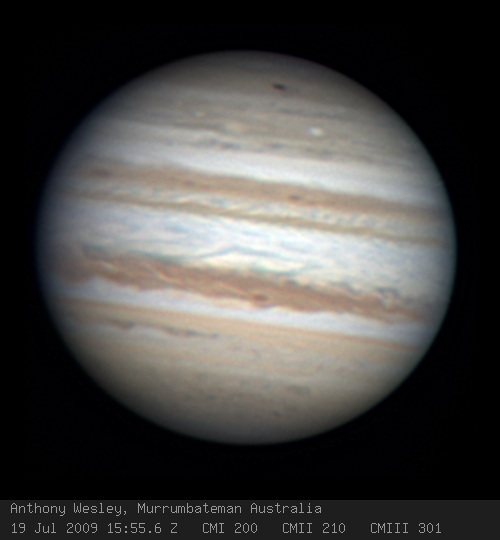 Image captured by Anthony Wesley on 19th July 2009 at 1554UTC from Murrumbateman Australia. Although this was all very exciting, and conjured up memories from the Shoemaker-Levy 9 Jupiter impact in 1994 (as documented by Hubble), I think the majority of blogs and news websites were initially reluctant to proclaim that this new dark spot was the site of an impact by a comet or asteroid. Why? Well, these events aren’t supposed to happen very often. That’s why the Shoemaker-Levy 9 impact was termed “a once in a lifetime” event. UPDATE (14:00 PST): Sky & Telescope Magazine is tracking developments, and reports that Leigh Fletcher, a scientist at the InfraRed Telescope Facility in Hawaii, is tweeting his findings from analysis of the Jupiter impact site. From the high infrared emissions in reflected sunlight off the dark spot, it is almost conclusive that the spot was caused by an impact by a comet or asteroid. That's what I call a lucky catch! This australian astronomer must be very very happy and proud of himself! Wow – now there is an “amateur” who has some very professional equipment! Way to go Anthony – maybe you should change careers (unless you are a teacher and can share the goods with future astronomers). Great eye for detail! Wow – what a find. Do you think Mr. Wesley and his keen eye will be interested in a PI job? (jk) It's like the witness discovering more than the detectives. Wow!! I'd love to be that Australian amateur astronomer who made such a discovery! Hurrahh for him! Look closely, are those little black pock marks made up of millions of 1 x 4 x 9 sized objects? It is very amazing post. Thanks for sharing it. Previous Previous post: British Astronauts? Yey! British Astronauts!